Idaho’s four-day schools have become a talking point in this fall’s elections — to the chagrin of at least two superintendents that use a four-day instruction calendar. They say the four-day schools are getting an unfair rap for slashing instruction time, and for compromising quality. “I understand why it’s out there in the political discussion, because it’s a quick soundbite,” Shoshone School District Superintendent Rob Waite said last week. It has certainly been a recurring campaign theme. GOP Gov. Butch Otter and Democratic opponent A.J. Balukoff have both expressed concerns about the four-day schedules, now commonplace in more than 40 rural districts. At a Boise State University forum last week, Otter said he hopes to restore school funding so four-day schedules are a thing of the past. Both state superintendents’ candidates have made the four-day schools a reference point. While Republican Sherri Ybarra has been vague about what she considers adequate school funding, she says a four-day school calendar is a symptom of inadequate funding. Democratic candidate Jana Jones goes a step further; she says the four-day calendar effectively cuts one month out of the instructional calendar. Waite doesn’t feel like the candidates are taking malicious shots at the four-day schools, but he does question Jones’ assertion. When Shoshone went to a four-day schedule, the district added the equivalent of eight days of instructional time — in part because the school day runs longer. The high school day starts at 7:53 a.m. and ends at 3:42 p.m., a 49-minute longer day than the old five-day schedule. The four-day schools may start their day earlier and end their day later, Jones said during a City Club of Boise forum last month. But Jones questioned whether the longer days are effective, especially in the lower grades. Waite sees another advantage to the four-day schedule. It frees up Fridays for a wide range of activities — including field trips, professional development for teachers and extra help for students. Now, said Waite, Shoshone can find time for all of these efforts, without cannibalizing classroom time. In Idaho’s latest round of five-star school ratings, Shoshone High School and Shoshone Middle School each received four stars. Shoshone Elementary School received three stars. Both Melba High School and Melba Elementary School received four stars in Idaho’s five-star ratings in 2013. So, where do Waite and Grover weigh in politically? Waite is endorsing Balukoff, appearing on one of the Boise school trustee’s campaign ads. Waite is staying neutral in the superintendent’s race. Grover is backing Otter. But after finishing fourth in the four-way GOP superintendent’s primary, Grover is not endorsing in the general election. 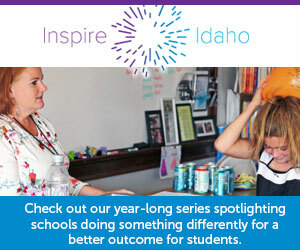 More data: See how all Idaho schools stack up at our Idaho Ed Trends site.